The opening ceremony for the exhibition named "At the beginning was the word: Concepts-images-script" took place at the National Art Museum of China (NAMOC) on Tuesday. Supported by the Greek Embassy in Beijing, the exhibition is a collaborative program between the National Museum of Contemporary Art, Athens (EMST) and the NAMOC, with the aim of deepening and enhancing cultural relations and exchanges in the field of art between Greece and China, within the framework of the Sino-Greek Year of Cultural Exchanges between 2017-18. 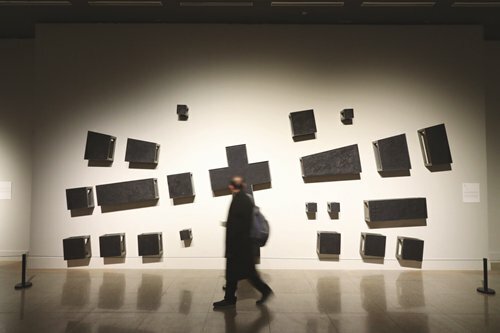 There are 75 selected works of 40 Greek and international artists from the permanent collection of the EMST that are presented at the NAMOC in Beijing between November 28, 2018 and January 17, 2019. The exhibition approaches language in its artistic dimension and explores its role as a written and spoken universal communication tool. The curator of the exhibition is Katerina Koskina, the director of the EMST. Koshina said in her remarks that all the works on show in the forms of paintings, drawings, videos, and installations are made of paper. "The show aims to explore the role of speech and writing in an age of global revolution in communication through the West's, and specifically Greece's individuality and the local references: historical, social, economic, linguistic, political and cultural, in the broader sense of the term," Koshina said. She noted that language is approached in its artistic dimension, as a universal tool of communication. 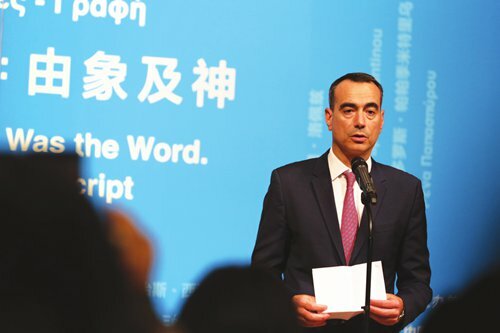 The First Counselor of the Greek Embassy in Beijing Georgios Arnaoutis and the director of the NAMOC Wu Weishan also attended the event's opening and gave a speech.